Cows and Butterflies is a Chess-like game of trades and promotions. The goal is to capture both of your opponent's Aces (Kings), to which purpose you are supplied with Cows (Pawns, sort of), Soldiers, a Monarch (Queen) and a Butterfly. Each player starts with 8 Cows, 4 Soldiers, 2 Aces, and 1 Monarch and 1 Butterfly. The 2nd and 7th ranks may optionally be set up in reversed order, with the Cows and Soldiers switched. The rules of Cows and Butterflues are identical to those of International Chess, except when noted below. The largest general rules change is that the object of the game is to capture the opposing Aces (Kings), not to checkmate one. Ace An Ace moves one or two squares forward, diagonally forward, left, right or straight backwards. It does not jump over other pieces. If both of your Aces are captured, you lose the game. The funny notation for the Ace is fB2R2. Monarch A Monarch slides any number of squares left, right, up, down or diagonally -- like an Orthochess Queen. It is not royal, and does not jump over other pieces. The funny notation for the Monarch is RB. Butterfly A Butterfly slides one, two or three squares left, right, up, down or diagonally, or leaps like an Orthochess Knight, one square left, right, up or down, then one square diagonally outward. Leaps may pass over occupied squares, and are indicated by the blue circles in the diagram. It may not jump over other pieces when sliding, however. A Butterfly is a sort of limited Amazon. The funny notation for the Butterfly is B3R3N. Soldier A Soldier moves one, two or three squares forward, diagonally forward, left, right or straight backwards. It does not jump over other pieces. If a Soldier reaches your opponent's back rank, it is required to promote to a Monarch. The funny notation for the Soldier (not counting promotion) is fB3R3. Cow A Cow may move one square diagonally forward without capturing, or one square straight forward to capture only (like a Berolina Pawn). On a Cow's first move (from either rank), it may also move one square straight forward without capturing. On the reaching the next to last rank, a Cow must promote to a Butterfly. In the diagram, the Cow in the lower-right is making its first move, and so can move or capture forward (indicated by a green circle), and move without capturing diagonally (indicated by a white circle). The Cow in the upper-left, however, can only move straight forward to capture (indicated by a red circle). The funny notation for the Cow (not counting promotion and initial move) is mfFcfW. Games tend to start with start with a complete or almost complete trade-off of Soldiers, followed by an Ace hunt with Cows threatening to turn into Butterflies (which are the most powerful pieces in the game). Notice that Cows do not easily protect each other, so there is no equivalent of the Pawn structure of Orthochess. Since Cows are color-bound until they make a capture, the initial forward move allows them to chose which color they will occupy. 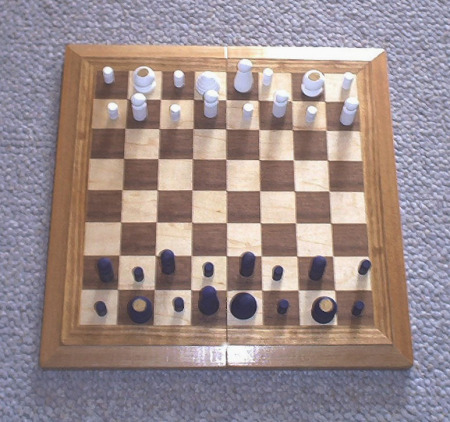 This game can be played with a normal Western Chess set by using the Pawns as Cows, Bishops and Knights as Soldiers, Rooks as Aces, and the Queen as the Monarch and the King as the Butterfly. It is also best to place poker chip under each Cow at the start to indicate that it has not yet moved, and so still can move straight forward a square without capturing. The pieces are little wooden objects that came from craft stores: the Cows are milkcans, the Soldiers are boys, the Monarchs are large Girls, the Butterflies are beehives and the Aces are knobs painted gold on top. Written by Peter Aronson from description by Jennifer Aronson. Cows and Butterflies. A simple Chess-like game of exchanges and promotions. Author: Peter Aronson. Inventor: Jennifer Aronson.